The fennel bulb contains virtually all of the usable meat. Smaller fennel bulbs are more tender and less fibrous than larger bulbs. 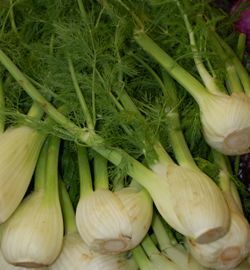 Store fennel in a plastic bag, in the high-humidity crisper section of the refrigerator for no more than 3 to 4 days. Fennel loses its flavor quickly so it’s best to use it as soon as possible. Can be roasted, used in soups, or chopped when raw in salads.